Following a year of hard work, lots of singing, and lots of fun, Alberta Heartland took their best performance to the annual convention in Surrey, B.C. To the cheers of loyal fans, the curtain opened to reveal the glitter of a beautiful red costume. Fringes swinging and bodies moving in perfect time, the chorus gave their rendition of "Don't You Go Breaking My Heart", followed by "You Are My Sunshine". It's all part of the annual convention and contest held by Region 26. This year the theme was "One Voice". 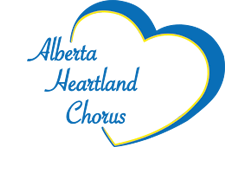 Alberta Heartland competed against fifteen choruses, all of whom had worked just as hard at perfecting their contest package. The chorus was thrilled to win Second in the Small chorus category, and Fifth overall. Two medals were added to the costume when the chorus took part in the Parade of Champions later in the afternoon. Another Sweet Adeline year comes to an end with the contest. Now we look forward to a Regional Education Symposium in August and the production of a show in November. 2017 promises to be another busy year with more music, more coaching and of course, more fun.